As part of a series of articles on interface concepts five years ago, I outlined a networked device for wardrobe management. 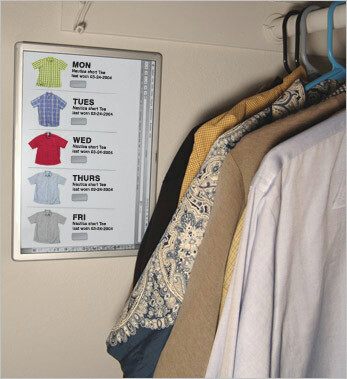 Wardrobe Manager was a WiFi connected wall-mountable display that used the RFID tags embedded in clothing to maintain digital inventory, usage patterns and recommendations for your wardrobe. Wardrobe Manager accessed information about each of the RFID tagged items in your closet including: product photos, warrantees, care instructions, purchase dates, cost, and more. 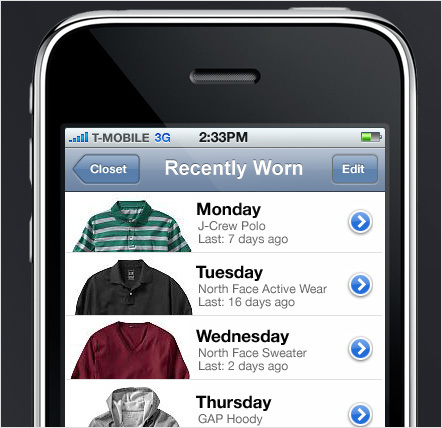 You could also set Wardrobe Manager to track your daily clothing selections. The interface would then make suggestions based on what you wore in the past, what remained in your closet, what could potentially match your current selection, what a trusted friend has suggested (through a shared social network), and what was most appropriate given today’s weather forecast. You'd never wear the same shirt to work twice in one week again! At the time, Wardrobe Manager was conceived of as a networked consumer device. In other words, you bought the hardware and got the software. Today, this assertion seems foolish as hardware platforms are so sensor-rich that products like Wardrobe manager only need code to run. In fact, if Apple's recent iPhone patents come to life, Wardrobe Manager can simply run as software on a networked smart phone with an RFID reader. Just install an application on your phone that makes use of the RFID reader and network connection. For me, this example illustrates an interesting trend. When consumer device platforms integrate a rich enough set of capabilities to develop on, many consumer devices become just software.